This Ovarian Cancer Awareness Ribbon Hat Teal is a great fundraiser product. 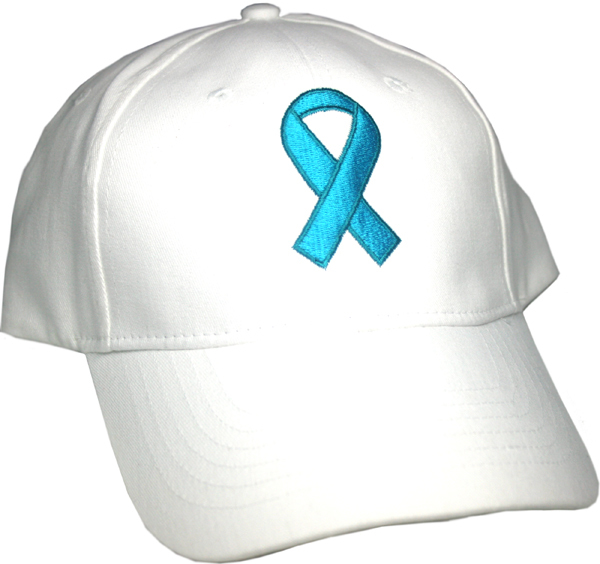 This new white Ovarian Cancer Awareness Ribbon Hat Teal offers a symbol of hope with its beautifully embroidered teal ribbon available in all cancer awareness colors. All cotton, soft, flexible white cap with adjustable strap, one size fits all. Wear it proudly!! This is a high quality cap This Cap is a perfect gift for that someone special in your life to show your support for their struggle with Ovarian Cancer. Wear to any and all of your events!